Regular water change is the most important routine needed towards maintaining a healthy and thriving aquarium fish community. Unlike lakes and ponds whereby there are flow of fresh water, your aquarium is different in such a way that it is a closed system and thus accumulating waste has no where to go to. Buildup of waste will eventually cause ammonia fluctuation, which are toxic to the fish. Although having a good filtering system will ensure that solid waste are removed, however these doesn’t work for those soluble chemicals that dissolve in water. Therefore, regular partial water change is a must if you intend to ensure that your fish stays healthy. One of the myths surrounding new aquarium owners is that, if you notice that your aquarium water level is reduced, merely replacing the evaporated water is not sufficient to overcome water chemistry changes. This is because the dissolved chemical still remains inside and thus, you are merely adding fresh water to dilute it. 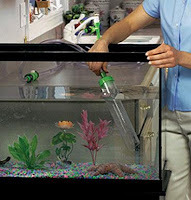 Therefore correct way of aquarium maintenance is to remove wastewater first before you add in fresh one. Age of aquarium: Water chemistry in newly startup aquarium will generally need more water changes in order to maintain balanced state. This is because, it takes time to establish the colony of beneficial aquarium bacteria that breaks down ammonia waste. Therefore, check all the water parameters like pH, ammonia and dissolved oxygen during this critical period. Types of fish: Larger fish and those that produce a lot of waste like goldfish would require shorter intervals of water change. On the other hand, smaller fish like neon fish would thus require less water maintenance. Interested to learn more about aquarium fish keeping? Find out what's the best way to setup your own aquarium from scratch and learn some of the useful tips along the way.